Ed Girrbach likes potato chips. So much so, he’s put money, determination and business acumen toward a made-in-Michigan venture that is frying 20,000 pounds of raw potatoes a week in the hills outside of Traverse City. The Great Lakes Potato Chip Co., co-owned by Ed, 63, and son Chris, 33, has gone from a conversation between two pizza restaurant owners to a new entrant to Michigan snack food shelves – a move aided by consumer appetite for locally made products and retailer interest in feeding that demand. 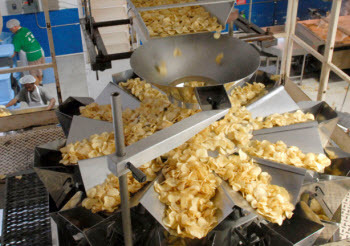 They made contact with equipment companies that make fryers, packers and other necessary elements; met with food brokers to discuss distribution; and traveled to other states to talk to owners of potato-chip plants and tour facilities. “So we kind of had a good idea of what it would take financially, and manpower-wise, to get it going,” Girrbach said. He said the duo saw market opportunity for a Northern Michigan chip manufacturer, and knew that buy-local interest was big, from attending food shows and operating their restaurant. Mike DiBernardo, economic development specialist at the Michigan Department of Agriculture and Rural Development, agreed that companies may find easier entry for their products because of buy Michigan/buy local interest. “I do believe that’s an opportunity for those entrepreneurs,” he said. A U.S. Small Business Administration loan and personal funds helped finance start-up costs. Within 10 months from concept, the venture produced its first chip, made from potatoes grown in Mecosta County. Along the way, one contact Girrbach tapped was the Michigan State University Product Center. Established in 2003 to improve opportunities in Michigan’s agriculture, food and bioeconomy sectors and help new and existing businesses access some of MSU’s expertise, the center assists entrepreneurs in developing and commercializing products and businesses. In addition, the MSU Product Center’s Birbeck said potato chips are a “very difficult market to capture,” given the national brands that have far bigger supermarket aisle play and more marketing power and money. From its May 2010 start with two part-time employees and Ed and Chris – with the father and son, among other things, loading a crate in the back of Chris’ pickup truck to drive to Mecosta and get in line with semis for potatoes -- the company has grown to nine full-timers, plus the co-owners. In Michigan, the company’s chips are sold in about 100 corporate-owned Spartan stores, a little over 100 Kroger stores, 66 ACO Hardware stores, 10 Meijer stores and four Whole Foods Market stores. They been cleared for sale in Wal-mart’s Traverse City store, with other Wal-mart store approvals pending in the Detroit area. Girrbach said sales were $225,000 in 2011, the company’s first full year of operation, and he expects this year to post $600,000 to $650,000 in sales and reach $1.2 million in 2013. New products on the horizon include a family size bag of chips and a salsa that will augment the company’s tortilla chips on supermarket shelves. Pretzels are also a possibility. And Girrbach’s advice to other entrepreneurs? Being Michigan-made is not the only key to the success of this (or any) product. They are very good chips!! We bought our second bag of them a few days ago to be sure we had them on hand. this is an incredible achievement to do this within 10 months. Thanks for this story - I'm going to search out these chips. I always try to support the home team!